Hi there members at Mairangi Bowling Club. My name is Rebecca Jelley and I have been a member of Mairangi Bay Bowling Club for nearly 12 years (although I do play the majority of my bowls out of Carlton Cornwall!). I was wondering if you could please include a small blurb about my new venture the Ultimate Bowls Championship (UBC) in your next Newsletter to Club members? Our first UBC episode is being screened on Sky Sport NZ in just over one week’s time and it would be great if club members could tune in to catch the action. From our inaugural UBC event held at Warilla Bowls and Recreation Club in Warilla, NSW, Australia last week we have produced six 1-hour episodes. Sundays starting 21st April 2019 and running weekly until 26th May 2019. There is a minimum of four repeats per episode during the week immediately after each episode airs. The first episode is on Sky Sport 4 at 5.30 pm but the channel and evening time varies between weeks (Channels 1-4). The UBC is fast-paced, contains a new scoring system (all bowls can score), modern technology, unparalleled prize money ($500,000 across the three annual events) and a TV broadcast platform across Asia and Australasia reaching 22 countries. Our Livestream on Facebook during the event reached nearly 100,000 viewers! 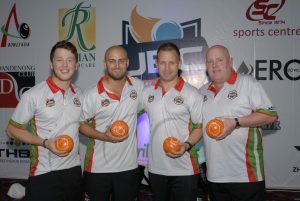 We had nine kiwis compete in the 24-team event against the world’s very best bowlers.